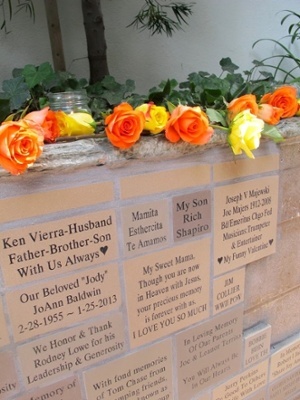 An enchanted backdrop of towering redwoods and autumn foliage provided a welcoming invitation for all that attended the annual Hospice of Santa Cruz County Memorial Wall Open House. The gathering took place on Saturday, September 13th at the Hospice of Santa Cruz County’s Redwood Memorial Garden in Scotts Valley. Multiple generations of families and friends came together creating a place of peace and tranquility to remember loved ones. A pristine fall afternoon enhanced the atmosphere of honor and remembrance. Hospice of Santa Cruz County’s CEO, Mike Milward and VP of Communications and Philanthropy, Cathy Conway addressed the outdoor crowd with comforting and inspirational words of love, hope and remembrance. The traditional laying of the flowers around the memorial tiles, trees, and garden stones concluded the afternoon of remembrance, offering families and friends, still another precious memory of their loved- ones to safely hold dear to their hearts.